Disaster recovery is the ability to recover a data center at a different site if a disaster destroys the primary site or otherwise renders it inoperable. It is only one component of an overall business continuity plan. 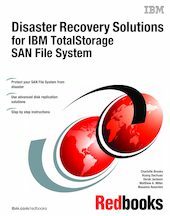 This IBM Redbooks publication presents various scenarios for recovery of the IBM TotalStorage SAN File System, ranging from complete recovery at an alternative site (using Metro Mirror to provide synchronous mirroring of the data) to how to replace a failed Metadata server. Each scenario includes step-by-step instructions. In other scenarios, we consider recovery from partial failures, such as failure in the storage system and failure of an individual server (either a SAN File System Metadata server or a SAN File System client). We also provide some examples of copy services options using the IBM TotalStorage SAN Volume Controller. This book is intended for those who already have a detailed knowledge of SAN File System. You should also have advanced knowledge of copy services offerings for the storage systems that are used for metadata and user volumes.